One thing thats always been a bit grey for me..... what defines a sports car/sports racing car? I kinda of understand (i know I dont own one of either!) but seems a bit vague. A car having either a non-detachable or a detachable roof with no more than one door on each side and a minimum of two seats situated one on each side of the longitudinal centreline. The two seats must be crossed by the same transversal plane. Interior dimensions must be inferior to the minimum dimensions applicable to Touring Cars. Series Production cars of which at least 2,500 identical examples are, or have been manufactured, within a twelve consecutive month period and which are equipped with a minimum of four adult size seats, an integral non-detachable roof, a minimum of two doors, one on each side of the vehicle and meet the dimensional requirements shown in K Appendix 2. Two-seater open or closed racing car, built for the sole purpose of taking part in races on closed circuits. Closed cars must have a windscreen and two doors (one on each side of the cockpit). It was a bloomin busy day so you might want to grab a cuppa if you’re planning on reading all this! With the Impreza coming off the road for some TLC next year, I decided to take it out for one last blast and compete in both the Celtic Speed Mini Cooper Cup and Sports & Saloons championships for the last round of the year. The timetable worked well for it, but it was all still a little hectic! Mini qualifying was up first. I had made some tweaks to the car set up and found it more to my liking, building up the pace to a 63.1. Not my fastest time, but not too unhappy with that, placing me 14th on the grid. Higher up would have been better (obviously!) but it was an improvement on the previous round. The session seemed to be over before I knew it, and I was back in and getting ready for S&S qualifying. By this point the rain had made an appearance, but wasn’t particularly heavy. This is where I find having a tyre choice to be a right headache! I went with the 888s, having more experience with them and knowing how to make them work. The track was super greasy with the initial rain and I found myself sliding off into the gravel at Macintyres on my first hot lap. I finished the session with a 60s lap – a few seconds off what I would have hoped for, but it still placed me on the grid where I had expected (6th place). Back in and prepare for the first Mini race. I was very conscious of championship contender John Duncan lining up just behind me – I knew he’d be on the pace from the start so made sure to give him room (and not ruin his race/day/year) and try to follow him through. The plan didn’t work and I got caught behind a pack of battling cars. The race was generally pretty uneventful. Started 13th, finished 13th. Back in to the Impreza! So by the end of the mini race a dry line had started to appear, but the forecast was showing more rain to come and it was drizzling on and off. I opted for the wets this time….knowing that most of the cars I would be battling against would be on the same. I think it was the right choice, and the couple of safety car outings definitely helped save them to the end of the race. I’m pretty confident with my starts, but Paul Brydon was lined up directly ahead and on the green flag lap took a while to get his car off the line. This messed my head right up! Was he going to be the same for the ‘proper’ start? Was I gonna run in to the back of him? So a bit more of a cautious start than normal and, having not driven on wets for 3 or 4 years, it took me a while to get the confidence in the grip levels. A safety car outing allowed the pack to bunch up again, but with one of the back markers being caught in between me and the front runners, I couldn’t push on at full speed when it pulled back in and the big powered boys up ahead pulled a big gap. With Ian Donaldson retiring and Robert Drummond spinning I managed to finish in 4th place. By this point, the wing on the Impreza had almost folded itself in half and was looking in a sorry state. Huge thank you to everyone that helped get this sorted – Brian Meddicks for taking the wing away and welding the supports, Paul Curtis & co for welding the car, the Minimax guys for offers of various bits of metal and the Cloan Motorsport guys for the tools. By the time the second Mini race came around the rain had well and truly arrived….so you can imagine my mood when sat in the holding area to find out that the wipers on the car had stopped working! Aaaaaaah! A lot of running around, but they couldn’t be sorted in time so I just lined up hoping for the best. The approach to Duffus with a full grid of cars, spray and no wipers is not fun! I lined up and could not see any lights! After craning my neck in every direction I eventually caught sight of one over the top of the car in front. I got an ok start, but got a tap from behind going in to Duffus and ended up backwards. Once I got going again the pack ahead hadn’t pulled too much of a gap….but the amount of spray and lack of wipers made it extremely tricky. I’ve never wanted to catch, but yet not catch, the cars in front so much! I finished near the back (17th I think) so room for improvement in race 3. Brian Meddicks arrived back to the circuit with my repaired Impreza wing just in time. Delighted to be lining up near the start of the pack I jumped in to the car. I got on the grid…and couldn’t see any bloody lights again! This time I had to duck down in my seat to catch the ones on the pit wall. I got a good start, but Ron Cummings disappeared out of view and the fear of running over the top of him set in and I eased off for the first corner, letting him through. It was a wet race, visibility was awful, my heated screen just didn’t seem to be doing it’s job and the new seating position in the car means I look out of the one bit of windscreen that the wiper doesn’t hit, so by half way through I could barely make out the apex of any right hander (of which there are many!). After a couple of gravel excursions, I eased the pace a bit and Ian Bonthrone got passed. I finished up in 5th place….not where I wanted to be but hey ho. On to the last race of the day….finally! The wiper issue had sort of been fixed. I had wipers for about 15s at a time, but then had to turn them off and on again. It was still wet! 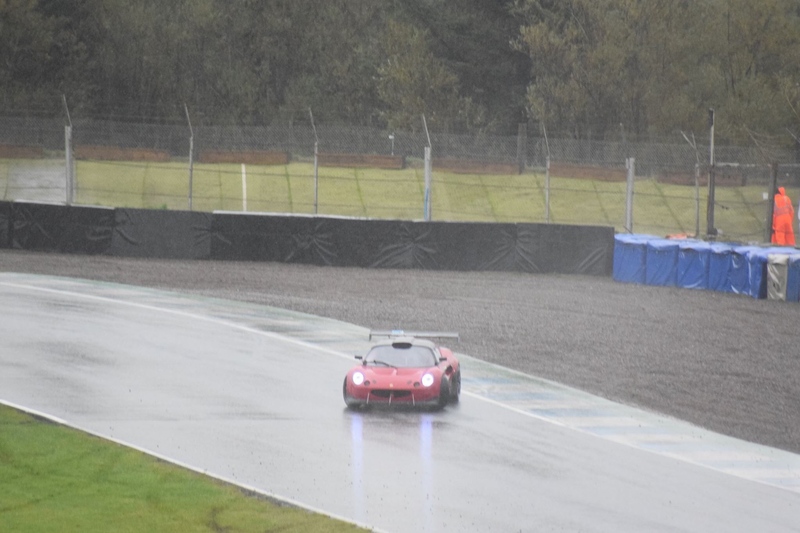 It was a pretty clean race despite the weather (and Blake running in to the back of me under the safety car!) and I finished in 13th place, making up a few places over the course of the race. I still can’t decide what I make of the last race weekend of the year. It wasn’t the best but it wasn’t overly horrific! Lots of niggly issues that I would have preferred to have avoided, but also lots of people willing to lend a hand to get things fixed…so huge thank you to everyone that chipped in. Big thanks to the marshalls….yesterday was horrible and my feet were soaked through so I’d imagine you would have been just the same! Big thanks also to anyone that walked passed the awning at some point during the day that I shouted ‘wet or dry’ to and gave me some form of answer which probably didn’t help my decision making in any way …but still gave me an answer! SMRC over with for another year…..on to Race of Remembrance in 32 days time! Pretty brave doing R2 with no wipers, not fun. Sums up the grip and conditions..